Home >Comments and Articles > The end of the world. Really? This was a talk given to Canberra Skeptics on December 8, 2012. I suppose there are some people in the world with access to the Internet or mass media who haven't heard the stories about how the world is possibly going to end on December 21, 2012. Whether the end will come simultaneously everywhere as soon as midnight happens in Kirabati or if it will roll around the Earth like some giant devastating Mexican Wave is generally not stated, but either would be bad. The usual reason for picking this date is that a calendar made by the Mayans several centuries ago only runs until this date. It's a solstice, so it's a useful date for all sorts of astrological predictions and it's just before Christmas so it's a good date to frighten people with. Predictions of the end of the world are not new, and there have been thousands of them over the centuries. I'm going to consider some of the predictions from the past, look at the dangers of false or unfulfilled predictions, and then see what the prognosticators have in store for us this year. For past predictions there are really two classes - religious prophecy and weirdness, with the latter including psychics, UFO believers and the truly insane. Predictions of the end of the world based on religion seems almost exclusively confined to Christian eschatology, which is not too surprising as a basic tenet of Christianity is that Jesus will return and this will herald the end of time as we know it. Other religions don't seem to be too concerned, with those based on reincarnation seeing no end to the cycles. One sect of Orthodox Jews has found evidence in the Torah that the Messiah will return in 2240 to initiate a thousand years of desolation before everything ends, and Rashad Khalifa has analysed the Quran using the same method as the famous Bible Code and found that lining up all the letters in all sorts of ways gives a date of 2280 but I don't think many Muslims take this seriously. An interesting thing about the Christian prophecies is that the authors seem to have forgotten that in Matthew 13, Jesus quite explicitly stated that nobody, not even the angels, would know when he was coming back until it happened. Also, most Christians will have recited the doxology Gloria Patri every time they have been to church, which translated from Latin says "As it was in the beginning, both now, and always, and to the ages of ages", or for Anglicans "As it was in the beginning is now and ever shall be, world without end". It is easy to ridicule people from the past who knew less that we knew now, but I found it interesting that real scientists devoted at least some of their time to trying to calculate the end of time. John Napier and Jakob Bernoulli both predicted times that were current (although Bernoulli died a few years before his prediction came false), Isaac Newton made the safe prediction of 2000. Another I put in the scientist category is Bishop James Ussher, often ridiculed for his estimate of 4004BC for the creation, but he based this on matching Bible stories with independent folk histories and produced the best estimate from the available data. When Charles Darwin walked past the end of my street on January 17, 1836, and looked out over the Jamison Valley, he assumed that he was looking at a drained seabed. He did not know that the Earth was old enough to allow the "tiny rill of water" to carve out the valley, and it wasn't until about a century later that the discovery of radiation and plate tectonics could explain both the age of the Earth and how the sedimentary rock he stood on managed to get almost a kilometre above sea level. Science is always a work in progress, and it is not fair to judge people harshly for doing the best with what they had at the time. The non-scientists who made religious predictions had no such excuse for getting it wrong, and it is surprising how many of them got it wrong on multiple occasions. Not only did they continually fail, but they managed to retain supporters and believers despite the failures. Several founded sects based on their predictions and managed to collect a lot of money along the way. Charles Taze Russell made at least eight failed predictions before his Bible Student Movement evolved into Jehovah's Witnesses, who made at least three more. William Miller's followers became Seventh Day Adventists, Herbert W. Armstrong had the most popular religious radio program in the world with cash flowing in every week despite at least four failed predictions. The most recent was Harold Camping who predicted the end on both May 21 and October 21, 2011, but these were just the last of at least six dates going back to 1994. It is rumoured that Camping pocketed $72 million in 2011. For being wrong. The crazies and the psychics are the most fun, although they raise a serious question about science education that I will revisit later. Nostradamus is there, of course, predicting July 1999 and maintaining his record of accurately predicting the history of the world up until the present moment but not beyond that. Sheldan Nidle had sixteen million spaceships coming in 1996 and Nancy Lieder had the twelfth planet, Nibiru, crashing into Earth in 2003 (both dates since revised to December 21, 2012). Ronald Reagan's psychic adviser Jeane Dixon predicted February 4, 1962, later updated to "2020-2037". Assorted people worried about the Large Hadron Collider in 2010 and Comet Elenin in 2011, with the Earth being sucked into a black hole or shattered into a million pieces. This brings me to the danger of failed prophecies. Believers have been known to sell their houses and property, leave their jobs and families and harm themselves and others. I've mentioned Charles Manson, but in Uganda in 2000 almost 800 people died because the world hadn't ended, we remember Marshall Applewhite and Heaven's Gate in 1997 when a group of intelligent young people committed suicide, the Aum Shinriko cult released sarin gas into the Tokyo subway in 1995 to hasten the end of the world. The planet Nibiru, which is larger than the Earth, will crash into the Earth or pass close enough to tear our world apart - if something that big was nearby at least some of the thousands of astronomers in the world would have detected it by now, and even if it were invisible the perturbations it would have caused in planet orbits would have been noticed. The Earth's rotation will change, either stopping completely, reversing spin or changing its axis of spin - all I really have to say here is "inertia". It isn't going to happen. All the planets will be in a straight line and the resulting gravity will cause devastating tides - even if the planets did line up, which they are not going to do, their gravitational effect on tides would be almost immeasurable when compared to the effect of the Sun and Moon. The Earth's magnetic field will reverse, with the poles swapping position - this happens on average every 400,000 years and we are overdue at about 700,000 years since the last time, but even if it happened (and it takes a long time, so it would have been noticed by now) it wouldn't have much effect except on compasses and pigeons. 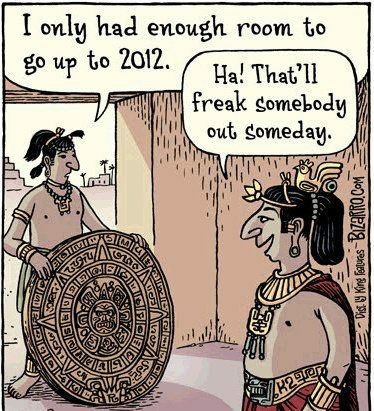 Time will just stop when the Mayan calendar runs out of days - the Mayan calendar was cyclic, just as ours is, and this is just as likely as there being no January 1, 2013, because the calendar on my office wall only goes to December 31, 2012. This is probably the silliest fear of all. I mentioned science education before, and that is what really concerns me about the fears of December 21. A knowledge of basic science, the stuff I was taught in primary school and the first years of high school, is enough to know that these predictions are not just unlikely but actually impossible. No huge planet can wander through the solar system unnoticed. A spinning body with the mass of the Earth can not suddenly change its axis of rotation or direction of spin. Major shifts in the magnetic field of the Earth can't happen suddenly. It's all very well to laugh at these silly predictions, but the laughing should stop when you realise that the fact that some people aren't laughing is a sign that they are lacking a basic education in how to tell fantasy and fiction from fact. And there be dragons in that unknown land.